A sovereign wealth fund recently asked if I could assist in setting up an institution to promote holistic health. “Wellness?” I asked. “Yes, but more,” was the response. “Prevention?” I probed. “Maybe, but even more: An institution that provides comprehensive healthcare, one that educates and promotes healthy behaviors to prevent or arrest disease, where treatment protocols influence people to live fuller, more active, and enjoyable lives.” This was an expansive goal even for a rich, single- payer country. I was intrigued and impressed by what was being contemplated: a vision that extended from policy to funding to making operating changes that would preempt or delay onset of disease to deliver superior outcomes and healthier populations. Before ideological resolution, if this is a market-led initiative or government overreach, whether it was centrally planned or demand-driven, a more profound question is warranted: Is this the right approach to public health? The trigger for the initiative was increasing sedentary lifestyle, poor diet, and indulgences that led to growing incidences of obesity and diabetes and put further stress on managing healthcare costs. Industry-led initiatives seek containment therapies that can be scaled to drive sustainable revenue and profit. The aspiration of a holistic health approach is reduced incidence of disease and finding cures to put traditional pharma commercialization practices and fee-based provider delivery models at risk. To use its own parlance, is the current healthcare system in need of medicine or surgery? Here in the U.S., several pharma CEOs testified to Congress this week on the high cost of medicines. Astra Zeneca CEO Pascale Soriot admitted that “affordability of drug therapies is an increasingly significant public policy and public health issue, and the current system is not sustainable — for patients, payers, and society.” Pharma, payers, providers, and patient advocates coming together with government to determine how to eliminate rebates is a necessary next step. Yet doing so only tinkers with, not transforms, an archaic system. Transforming ways to deliver superior healthcare warrants designing and determining how a new system will be funded. Sovereign wealth funds and single- payer countries are evaluating bolder, more fundamental solutions. Our focus has been tending to the sick, not promoting wellness. We have focused on fixing what is broken for individual patients and the healthcare system as a whole, not ensuring that fewer people fall sick. Our impetus to keep people out of hospitals is correct; it acknowledges that caring for patients upstream, before they are admitted, reduces cost. Yet there is too little investment in wellness protocols that protect them from falling sick and keep them healthy. A system designed for acute care does not adequately address chronic-care needs. Infectious disease may get headlines, but how we provide chronic care is what breaks the bank. A system designed for acute care that restores health postemergency is ill-suited to care for growing cohorts of patients with chronic diseases (80 percent of all healthcare spending is for chronic care). Frequency, outbreak, and deaths from infectious disease and epidemics have declined. In 1918/19, influenza killed 20 million, in 1957, H2N2 caused over 1 million deaths, and in 2014, the Ebola outbreak resulted in 11,300 fatalities. The CDC and BARDA (Biomedical Advanced Research and Development Authority) have effectively protected us against infectious diseases. Better deployment of human, material, and technology assets to preempt, reduce onset, and affordably accelerate treatment of chronic disease patients is overdue. Genetic, behavioral, and environmental factors cause chronic diseases. Pharma focuses on treatments that address genetic causes; controlling costs will require changing behaviors and improving environmental factors via public-health initiatives. Our approach must change from containing to preventing disease. Most medicines slow progression of disease. Industry does this well, but who focuses on prevention, wellness, and cures? Mandating improved air-quality standards to reduce smog in cities. Reduced mortality from heart disease, strokes, cancer, and respiratory disorders demonstrates our ability to slow the trajectory of disease and control healthcare costs. Where is such resolve to retard obesity, metabolic disorders, and diabetes by regulating and appropriately taxing the manufacturing, distribution, and marketing of food and drinks high in sugar and salt? Educating populations on healthy eating and hygiene must be a priority, along with tax initiatives to fund a reserve to contain medical costs. A growing population requires more robust policy interventions. Aging populations have different needs. Americans pay taxes to keep us healthy, safe, and protected, not to leave anyone, anywhere . In farms, cities, or battlefields . Behind. Does our health and insurance system do this? Do we develop, deliver, and cover age-appropriate products and services to populations that need corrections for degenerative conditions? An estimated 48 million Americans have hearing loss that is not covered by insurance. Are the points of care delivery optimal? Hospitals, urgent care centers, assisted living facilities, and nursing homes need not provide all care: home care and community clinics are cheaper and more convenient. No amount of high-priced medicines, telemedicines, or technology can replace timely access to doctors. Future access to doctors is threatened when new doctors graduate with over $300,000 in student loans and earn, on average, $223,000 as primary care physicians, or $212,000 as endocrinologists or pediatricians. Psychiatrists’ earnings increased 16 percent over the previous year — reflective of the deteriorating state of our nation’s mental health and increased demand for services. NYU and Kaiser Permanente School of Medicine now provide free tuition, but more Americans need incentives to practice, at least in specialties, postmed schools. Vulnerable populations pose a threat not just to themselves, but to all. Merck CEO Ken Frazier conceded to Congress that “it’s the poorest patients who pay the most for medicine by paying the list price, while others benefit from rebates.” A fixation to repeal ACA results in fewer Americans having health coverage. Fewer people will take medicines, diagnosis and treatment will be delayed, and ER and hospital visits will increase. This will increase systemwide costs. Mobile populations will require us to rethink healthcare challenges and delivery. America is on the move. Americans work, on average, 44-hour weeks and 260 days every year. U.S. airlines ferry 850 million passengers, and we spend between nine and 31 days commuting every year. More than 211 million Americans watched, read, listened to, or interacted with media daily for up to 3 hours and 35 minutes on mobile devices, 2.5 hours of which were on apps on smartphones. Yet our lifestyle is more sedentary. Congested roads, crowded planes, and mobile phones point to a busier, more connected, and prosperous population, not a healthier one. The trajectory of healthcare costs, adjusted for population and inflation, foretells challenges of mental stress, physical strain, long hours of inactivity, and more food and less nutrition on the go. We are more connected via a keyboard, screen, headphone, or mic, none of which improve our vision, hearing, mobility, or social quality of life. Good public policy is interest-group agnostic; it puts Americans first and Republicans, Democrats, progressives, conservatives, whites, or nonwhites, etc., next. It acknowledges changing realities and future needs and establishes measurable population health goals. How we allocate capital resources across public health interventions, bringing new medicines and treatment protocols today, will determine our wellness in the future. 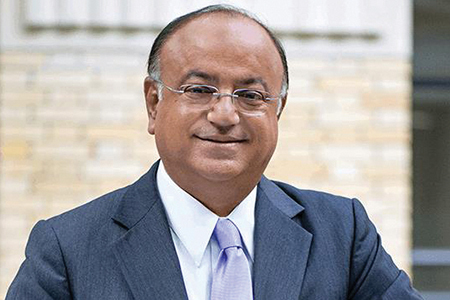 SURESH KUMAR serves on the board of Jubilant Pharmaceuticals and Medocity. Formerly, he was U.S. assistant secretary of commerce and executive VP at Sanofi.